Carolingian art permitted the drawing of human figures during the Iconoclasm controversy of the 9th century? Carolingian art comes from the Frankish Empire in the period of roughly 120 years from about AD 780 to 900 — during the reign of Charlemagne and his immediate heirs — popularly known as the Carolingian Renaissance. The art was produced by and for the court circle and a group of important monasteries under Imperial patronage. There was for the first time a thoughgoing attempt in Northern Europe to revive and emulate classical Mediterranean art forms and styles, that resulted in a blending of classical and Northern elements in a sumptuous and dignified style, in particular introducing to the North confidence in representing the human figure, and setting the stage for the rise of Romanesque art and eventually Gothic art in the West. The Carolingian era is part of the period in Medieval art known as "Pre-Romanesque". Having established an Empire as large as the Byzantine Empire of the day, and rivalling in size the old Western Roman Empire, the Carolingian court must have been conscious that they lacked an artistic style to match these or even the post-antique (or "sub-antique" as Ernst Kitzinger called it) art still being produced in small quantities in Rome and a few other centres in Italy, which Charlemagne knew from his campaigns, and where he was crowned Holy Roman Emperor in Rome in 800. Reasonable numbers of Carolingian illuminated manuscripts and small-scale sculptures, mostly in ivory, have survived, but far fewer examples of metalwork, mosaics and frescos and other types of work. Many manuscripts in particular are copies or reinterpretations of Late Antique or Byzantine models, nearly all now lost, and the nature of the influence of specific models on individual Carolingian works remains a perennial topic in art history. As well as these influences, the extravagant energy of Insular art added a definite flavour to Carolingian work, which sometimes used interlacedecoration, and followed more cautiously the insular freedom in allowing decoration to spread around and into the text on the page of a manuscript. Drogo Sacramentary, ca. 850: a historiated initial 'C' contains the Ascension of Christ. The text is in gold ink. The most numerous surviving works of the Carolingian renaissance are illuminated manuscripts. A number of luxury manuscripts, mostly Gospel books, have survived, decorated with a relatively small number of full-page miniatures, often including evangelist portraits, and lavish canon tables, following the precedent of the Insular art of Britain and Ireland. Narrative images and especially cycles are rarer, but many exist, mostly of the Old Testament, especially Genesis - New Testament scenes are more often found on the ivory reliefs on the covers. The over-sized and heavily decorated initials of Insular art were adopted, and the historiated initial further developed, with small narrative scenes seen for the first time towards the end of the period - notably in the Drogo Sacramentary. Luxury manuscripts were given rich covers with jewels set in gold and carved ivory panels, and, as in Insular art, were prestige objects kept in the church or treasury, and a different class of object from the working manuscripts kept in the library, where some initials might be decorated, and pen drawings added in a few places. A few of the grandest imperial manuscripts were written on purple parchment. The Bern Physiologus is a relatively rare example of a secular manuscript heavily illustrated with fully painted miniatures, lying in between these two classes, and perhaps produced for the private library of an important individual. The Utrecht Psalter, stands alone as a very heavily illustrated library version of the Psalms done in pen and wash, and almost certainly copied from a much earlier manuscript. 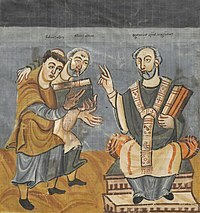 Other liturgical works were sometimes produced in luxury manuscripts, such as sacramentaries, but no Carolingian Bible is decorated as heavily as the Late Antique examples that survive in fragments. Teaching books such as theological, historical, literary and scientific works from ancient authors were copied and generally only illustrated in ink, if at all. Carolingian manuscripts are presumed to have been produced largely or entirely by clerics, in a few workshops around the Carolingian Empire, each with its own style that developed based on the artists and influences of that particular location and time. Manuscripts often have inscriptions, not necessarily contemporary, as to who commissioned them, and which church or monastery they were given to, but few dates or names and locations of those producing them. The surviving manuscripts have been assigned, and often re-assigned, to workshops by scholars, and the controversies attending this process have largely died down. The earliest workshop was the Court School of Charlemagne; then a Rheimsian style, which became the most influential of the Carolingian period; a Touronian style; a Drogo style; and finally a Court School of Charles the Bald. These are the major centres, but others exist, characterized by the works of art produced there. Saint Mark from the Ebo Gospels. Figurine line drawing with colour. 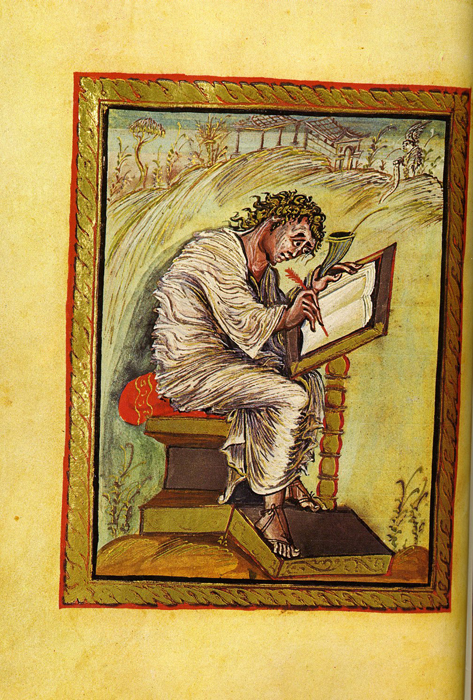 The Court School of Charlemagne (also known as the Ada School) produced the earliest manuscripts, including the Godescalc Evangelistary (781–783); the Lorsch Gospels (778–820); the Ada Gospels (picture:St.Matthew); the Soissons Gospels; and the Coronation Gospels (picture:St.Matthew). The Court School manuscripts were ornate and ostentatious, and reminiscent of 6th century ivories and mosaics from Ravenna, Italy. They were the earliest Carolingian manuscripts and initiated a revival of Roman classicism, yet still maintained Migration Period art (Merovingian and Insular) traditions in their basically linear presentation, with no concern for volume and spatial relationships. In the early 9th century Archbishop Ebo of Rheims, at Hautvillers (near Rheims), assembled artists and transformed Carolingian art to something entirely new. 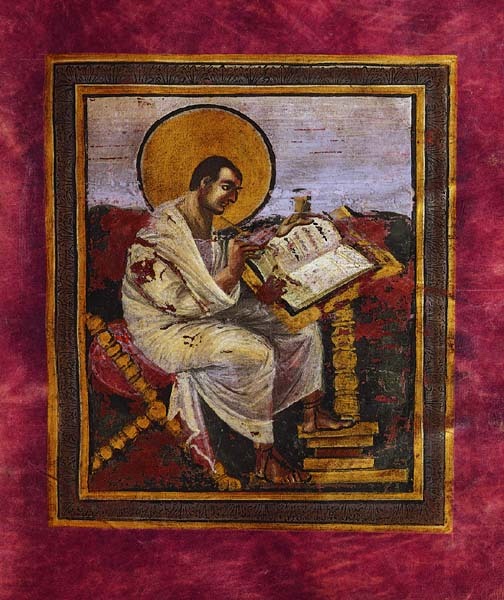 The Gospel book of Ebbo (816–835) was painted with swift, fresh and vibrant brush strokes, evoking an inspiration and energy unknown in classical Mediterranean forms (see image this page and picture:St.Matthew). Other books associated with the Rheims school include the Utrecht Psalter (picture:gallery), which was perhaps the most important of all Carolingian manuscripts, and the Bern Physiologus, the earliest Latin edition of the Christian allegorical text on animals. The expressive animations of the Rheims school, in particular the Utrecht Psalter with its naturalistic expressive figurine line drawings, would have influence on northern medieval art for centuries to follow, into the Romanesque period. From the Utrecht Psalter, 9th C. Naturalistic and energetic figurine line drawings were entirely new, and were to become the most influential innovation of Carolinian art in later periods. Charles the Bald, like his grandfather, also established a Court School. 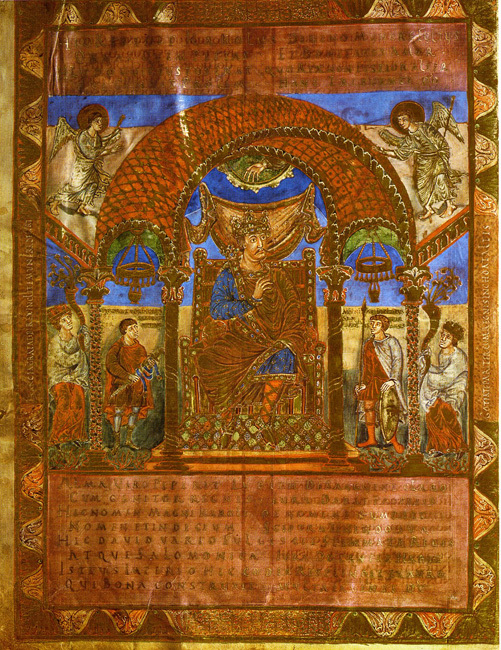 Its location is uncertain but several manuscripts are attributed to it, with the Codex Aureus (870) (picture:Charles the Bald Enthroned) being the last and most spectacular. It contained Touronian and Rheimsian elements, but fused with the style that characterized Charlemagne's Court School more formal manuscripts. Detail of book cover (11th century, not Carolingian). Luxury Carolingian manuscripts were intended to have ornate covers in precious metal set with jewels around central carved ivory panels - sometimes these were donated some time after the manuscript itself was produced. Only a few such covers have survived intact, but many of the ivory panels survive detached, where the covers have been broken up for their materials. The subjects were often narrative religious scenes in vertical sections, largely derived from Late Antique paintings and carvings, as were those with more hieratic images derived from consular diptychs and other imperial art, such as the front and back covers of the Lorsch Gospels, which adapt a 6th century Imperial triumph to the triumph of Christ and the Virgin. One of the finest examples of Carolingian goldsmiths' work is the Golden Altar (824–859) (picture:altar), also known as the Paliotto, in the Basilica of Sant'Ambrogio in Milan. The altars four sides are decorated with images in gold and silver repoussé, framed by borders of filigree, precious stones and enamel. Fragmentary paintings have survived at Auxerre, Coblenz, Lorsch, Cologne, Fulda, Corvey, Trier, Mustair, Malles, Naturno, Cividale, Brescia and Milan. "Carolingian art". In Encyclopædia Britannica Online.